When sourcing first started, it was usually a name generation or pure research role. 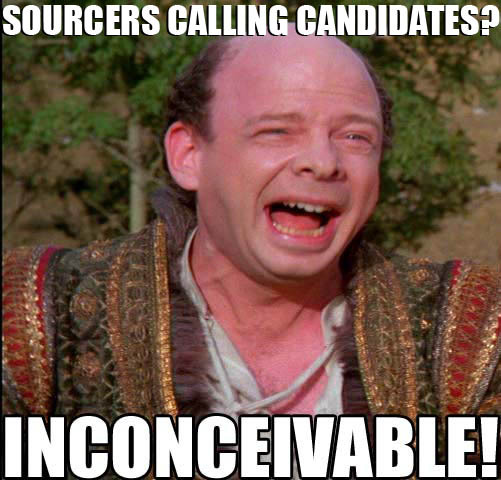 Sourcers “supported” the recruiter through their candidate generation efforts. But over the last decade that has progressed. The sourcer is also becoming a candidate engagement specialist or even the recruiter. Now I realize this is not the structure in every company, but times are changing and will continue to change. For budget reasons, headcount, or to speed up the hiring the process, we will continuously see the roles of sourcer and recruiter blend. The recruiters will get better at sourcing even if it’s only for a short time during the day, and the sourcers will get better at contacting candidates and speeding up the hand-offs in the hiring process. You are not the only one to call them – Even if you are the greatest salesman of all time; you are almost certainly not the first person to call them. That just means that your messaging should be sincere, personalized, and different from the rest. They could honestly not be able to talk with you at the moment – This one is hard to believe, right? But the candidate could be waiting for a collect call from a family member and you are keeping them from answering that call. So instead, find out the soonest that you can call them back and make sure you do it. Show an Honest Interest – Between spam calls from marketers, calls from companies that ALREADY have them as a customer, and 30 recruiters told the candidate they had the “perfect job” for them, your candidate might be a little bit desensitized. One of the main reasons for this is because these people making the calls are just concerned about closing the sale and they have no problem making that the main point of the conversation. Instead, show an honest interest in what the candidate does and let them talk about what they do. You will be surprised at how much candidates like talking about how good they are at their jobs. Q & A – The newbie recruiter or salesperson comes into the call like a bull in a china shop. I think that worked for sales tactics in the 70s and 80s, but most certainly not now. Instead you should take the quid pro quo approach: you ask questions about the candidate’s job, what they do, what they like about it, what they think about the company, what their like is like outside of work. By you getting those answers earlier on, you can better formulate what you will be selling to them: a life-changing career. Six Degrees of Kevin Bacon – People know people. Simple as that. And those referrals may not be on Linkedin (gasp!). Some people you end up talking to are completely happy and will not move from their jobs. That’s fine. By you following the previous steps, they will more likely give you referrals and other leads because they like your style. If you come off rude and self-centered over the phone, then they are probably thinking that they would never refer their worst enemy let alone a friend. Numbers Game – A good recruiter or sourcer will get a complete picture of the candidate’s interests, work, life, and other interviewing activity. But you shouldn’t bet the house on one candidate. There are too many variables. Life happens and you should expect surprises. So make sure that you are making a good number of calls per day. Numbers, as well as the quality of the calls, will increase your odds. Hopefully this doesn’t seem as scary now that I’ve broken it down for you. Obviously there are more details that we could go into, and normally I do when I conduct trainings for recruiters and sourcers. Just remember that changing jobs is big event in most people’s lives. Your job is to manage the perceived risk of that change, and demonstrate the reasons WHY you think this job is “perfect for the candidate”. If you have honest reasons why and you make the candidate see them as well, then you have a winning combination.